What is everyone’s job (CS, Sales, Product)? Product: The product team’s job is to decide what the vision of the product is, what to build first, when to do it, and why. Client Success: To help customers solve their challenges and achieve their goals with your product, as well as relaying user feedback to the product team. Sales: To find good fit prospects and show them how your solution can solve their challenges/help them achieve their goals. Take all the energy, vision, and belief that you and your team have in your product/service, and transfer that to the prospective customer. Relay feedback to the product team, specifically why prospects aren’t moving forward. Communication has never been easier. With tools like email, Slack, meetings, and Gchat, chatting with someone in your org is a simple message away. 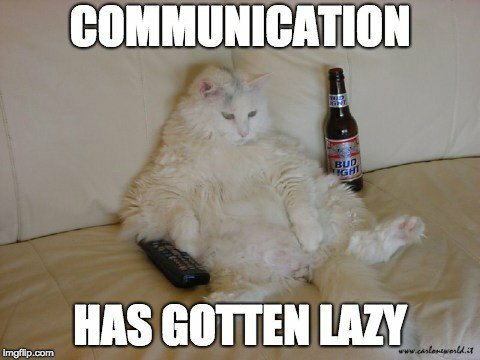 However, one of the biggest problems with the current state of product management is around communication between teams. 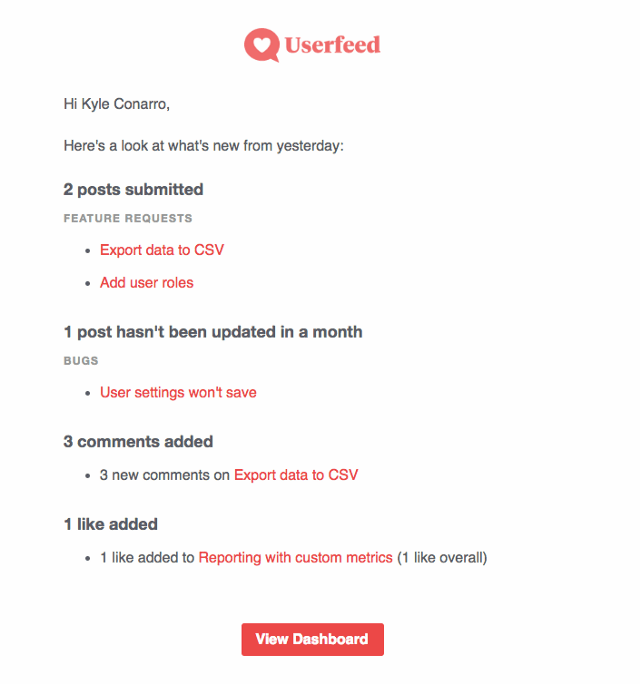 On top of that, we get a daily digest of every new feature request, comment, like, status change, and any stale requests we haven’t touched in a while. This keeps everyone in the loop with a consistent cadence. We believe everyone should be on the same page at all times. Socializing the product vision and keeping customer facing teams in the loop will help everyone in their conversations with customers/prospects. 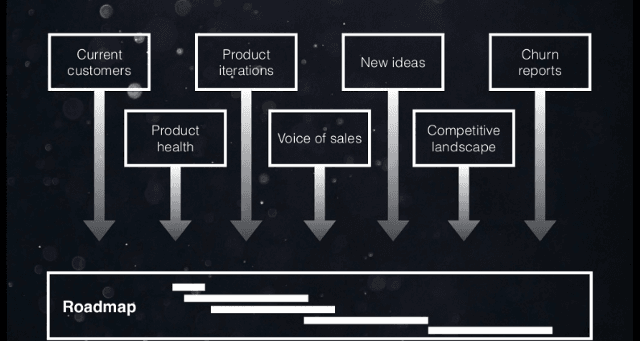 The most common strife between customer-facing teams and product, is selling something you don’t have and/or giving unrealistic timelines for things on the roadmap. The panel’s consensus on this was that if it’s not complete/shipped, exact dates should not be given. Period (there was actually applause from the crowed when this was mentioned 🤣). Anything can derail a timeline, so dates shouldn’t be discussed. One way to avoid this would be organizing your roadmap into statuses (ie. planned, In progress, Complete). Regardless, it’s still incredibly important to set expectations internally about what is discussed with customers/prospect. One way we deal with this is to allow product to control our status-based roadmap, which sales/CS can direct customers and prospects to (ours is an app within Intercom Messenger). 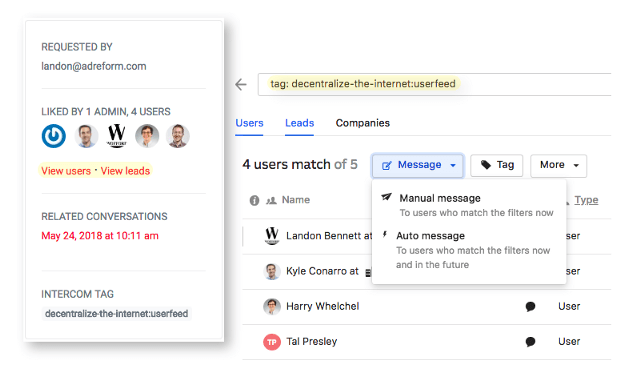 Our product team can decide what’s public and what’s private, and what we show to leads vs users (Intercom allows you to show different things in Messenger). A lot of product folks hate the idea of sales teams selling things before they’re built, and rightly so. But selling an actual thing and a timeline is much different than selling vision and direction (I call this selling dreams). I’m a big proponent of selling dreams, especially early on. Only selling what’s in the product now is lazy (no one buys a bunch of features anyways). Customers aren’t just buying what’s in the product now, but also, where your going (vision). They don’t want to start from scratch a year from now and implement something different. Selling dreams does not mean lying or setting unrealistic expectations. It means setting the stage for your company’s vision and how that aligns with the customer’s challenges and long term goals. 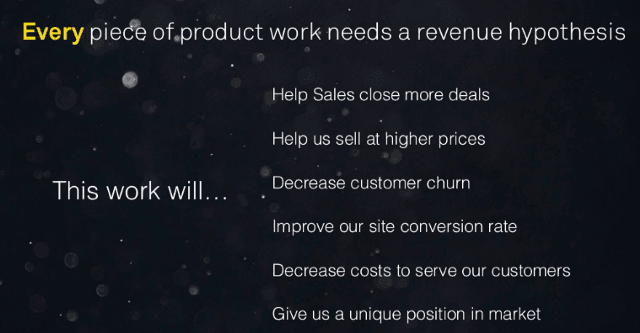 Product should be evangelizing this vision internally. The more the customer-facing teams hear it, the better they can speak to it with customers. At a one of my previous companies, we really dropped the ball on the customer feedback. Our process was the head of product reaching out to customers asking for feedback. Not only does this yield a fairly low response rate (people are busy and don’t want to talk), but prompted feedback is usually of less quality. How you gather your feedback is super important to the quality of feedback you get. When you only prompt users to give you feedback (forum, survey, email, etc.) you get opportunity statements (it would be great if..), which usually leads to vitamins rather than pain pills. A better form of feedback is given first as a problem statement. 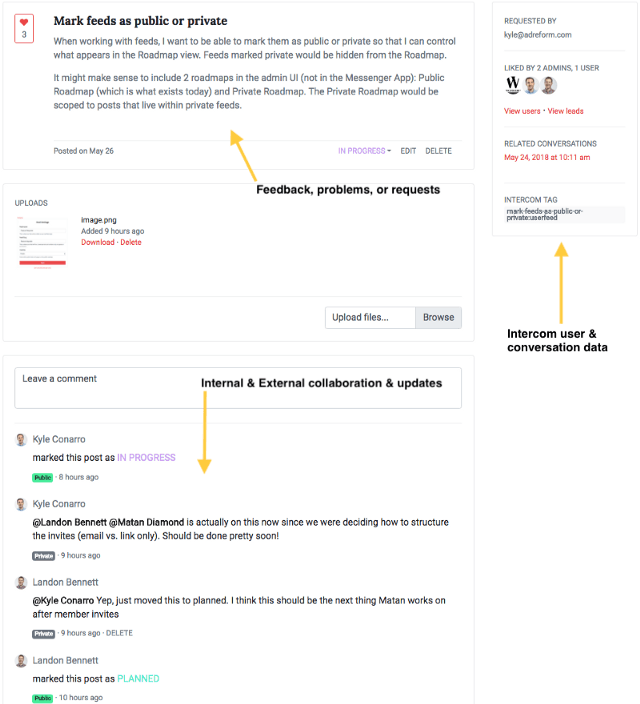 Statements like “How do I…, I am unable to…, or do you support…” Most of the time this feedback is given to customer-facing teams (customer success or sales) so it’s important that you make it easy for them to gather/push that feedback/conversations to the product team. 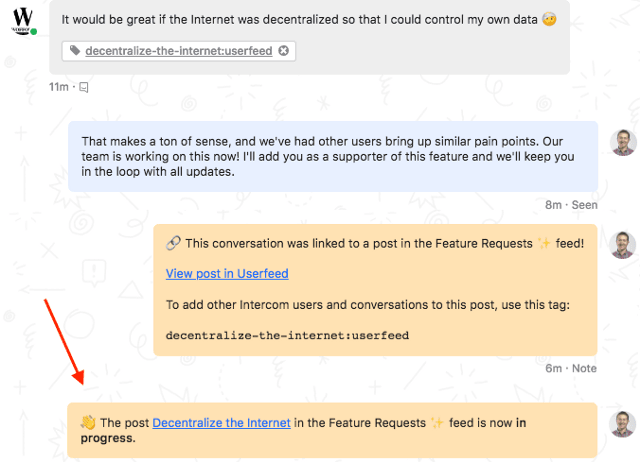 This is why we make it easy to push data from Intercom to Userfeed, as we believe Intercom is where we get the highest quality feedback (problem statements). As a product team, your best source of user feedback should be coming from your sales and customer success teams. If you train them correctly you can scale user feedback dramatically and get at the root of your customers/prospects problems. The more data and context you have, the better product prioritization decisions you can make. One interesting idea that arose, was the idea of tying part of sales/customer success compensation to user feedback (or bonuses). Similar to Sales Qualified Leads being a metric, you could implement something like Product Qualified Feedback (PQFs has a nice ring to it, right?). This would incentivize customer facing reps to gather and pass helpful product requests and feedback to the product team. The key point here is that everyone is on the product team. Get everyone aligned around the mission, the strategy, and the customer, and the decisions will work themselves out.